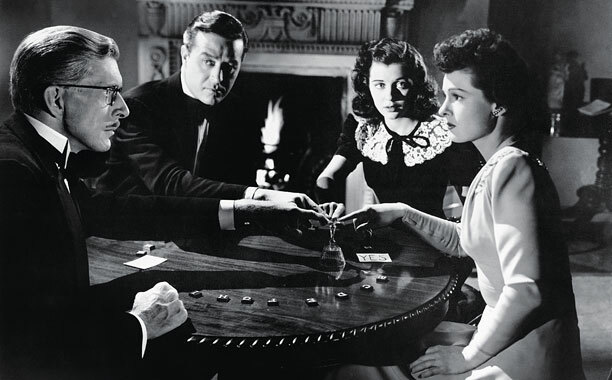 Dr. Scott (Alan Napier), Roderick Fitzgerald (Ray Milland), Stella Meredith (Gail Russell), and Pamela Fitzgerald (Ruth Hussey, from left to right) try to find out what the supernatural events in the haunted house are all about. Horror films were popular in the United States in the 1940s, in spite of the Second World War and the feel-good stories Hollywood brought to the silver screen to distract the people. Russian-born writer and producer Val Lewton, in particular, managed to attract a cult following with masterful B-movies such as Cat People, I Walked With A Zombie, or Isle Of The Dead, but other greats like Alfred Hitchcock also dabbled with the genre when arriving stateside. Some of these films from that era also featured A-level talent and not just Boris Karloff and other genre-specific stars. The Uninvited by director Lewis Allen based on a bestselling novel by Dorothy Macardle belongs to that category.